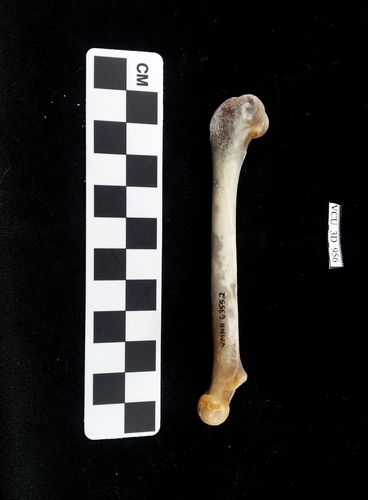 We began building our digital zooarchaeological collection with raccoon bones, including this femur from the Virginia Museum of Natural History. This bone was scanned and edited by Mariana Zechini, our Digital Zooarchaeologist. As with the cat and dog femurs, this turkey femur is from the Virginia Museum of Natural History and was scanned in early October 2013. Today’s object is again from the Virginia Museum of Natural History and also was scanned in early October 2013. Since I posted a cat femur yesterday, I thought I would post a dog femur today. 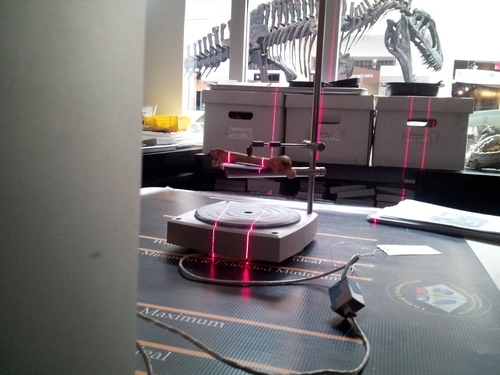 Scanning a femur at the Virginia Museum of Natural History. My most recent trip to the Virginia Museum of Natural History was in early October 2013, where I gave a public lecture. Among the items I scanned in the physical type collection was a femur (left) of a cat. I scanned a number of other femurs that will be posted in the coming days. Femur (left) of a cat. Note: I originally posted this at the Virtual Curation Laboratory web site but future posts of animated object of the day will reside here. On May 7, 2013, I arrived at the Virginia Museum of Natural History (VMNH) in Martinsville, Virginia, accompanied by Digital Zooarchaeologist Mariana Zechni, and Digital Curation Supervisor Ashley McCuistion. Our goal this day and the next two days was to scan animal bones from the type collection maintained by VMNH’s Curator of Archaeology Dr. Elizabeth Moore, as well as other items in their archaeological collection. One of the more unique was this pathological deer rib/vertebra, which stood out in the VMNH collection. While we do not have the actual object, we do have a digital model–which we have also printed. Click on image for animation.